IZotope has already released plug-ins for various sound domains, such as distortion(Trash), mastering (Ozone), time stretch and pitch shift (Radius) and other (Spectron, iDrum, PhatMatik Pro, Vinyl...). Now it is time for sonic restoration, with RX, a complete software solution. 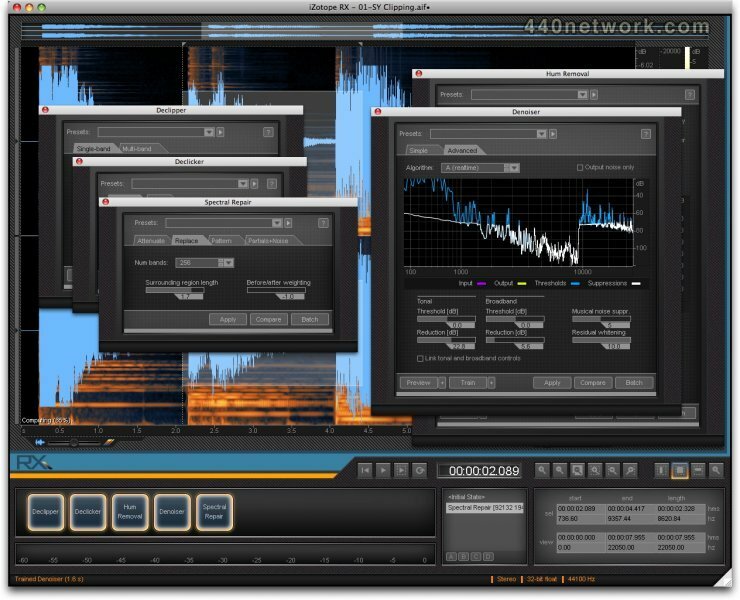 The editor has created its own algorithms, in order to offer an alternative to the reknowned algorithms from Algorithmix or Noveltech licenced to other soft editors (Merging, Waves, CreamWare, TC Electronic, Sony Oxford, AudioGrabber...), or even to pro solutions such as Algorithmix NoiseFree or reNOVAtor, NoNoise II from SonicStudio and of course Cedar. RX is currently only available as a standalone application for Mac and PC (Windows XP, x64, Vista, Mac OS 10.3.9 or later), but plug-in versions of its modules are planned for 2008. RX gathers its functions in a resizable window which will benefit from a big display, however it could as well be adjusted to fit a smaller one. Some functions are located in floating windows, such as Preferences or the Modules. In the upper part is a display where you'll monitor both the graphic waveform and its spectral analysis. Each of the displaying mode has its own settings for horizontal, vertical zooms and transparency. The Spectrogram Settings allow to precisely set all display parameters (be careful to always keep an eye to the computing time and resources...), in order to have the best environment for Spectral Repair, for instance, and you'll find other options in the Preferences window. The latter will allow you to authorize the software, set the audio card and options as well as all the key shortcuts (with preset saving, bravo!). You can also select the view/time format in the eponymous menu, between Decimal (hh/mm/ss...), Samples and Frames (acccording to the Preferences setting). All the tools are directly available from the main interface, selection, zoom, transport commands, Module selection, Undo history and numerical displays, even if some subtleties are located in the menus or accessible via right-clic. The Help menu leads to the very complete interactive html manual. Pop-up descriptions are also provided when the mouse hovers over a name or a parameter. So let's open some audio files and process them with the RX five modules (seven in RX Advanced). RX includes five Modules, Declipper, Declicker, Hum Removal, Denoiser and Spectral Repair. Each has its own parameters set, opening in a floating window (with opacity setting, one of iZotope's favorite feature). Each Module allows prelistening, to compare between several settings (well done...) and Batch processing. There's a few presets to use as a starting point, but you can also start from scratch. RX can read WAV, Broadcast WAV, AIFF, MP3 and WMA mono or stereo audio files. The error window displays: "Currently only mono..." A marketing trick or the promise of a future multichannel capability? RX can also directly import the audio from a video file, without the help of any third party extracting software (recognized formats: AVI, MPEG, WMV, DV, MOV and M4V). After processing, the saving can be done in WAV or AIFF, with several resolution and dithering options. Let's try the first Module. Digital clipping is certainly one of the most awful sounds, resulting from the overload of A/N converters or any digital malfunction. If it's easier and faster to record again the saturated take, it's sometimes impossible. All you can do is try to "repair" the clipping files with EQ and filters or draw the waveform in an audio editor, to transform these little squares in a nice curve. In both cases, it's a time consuming process and very often the result doesn't do justice to the amount of time you've spent on it. Thans to the Declipper module, these repairs of digital clipping (as well as analog) can be automated. The choice between Single- and Multi-Band processing is material dependent: you won't find precise examples in the manual, because they would be irrelevant. You have to make your own tests. Be careful when you using the Multi mode, otherwise it'll add unpleasant artifacts to the final result. Settings are identical with the exception of the number of bands to specify in Multi mode (from 8 to 128). First, you have to select the whole file or only a region with clipped audio. Secondly you click on Compute, that will reveal the clipping point. Then you have to adjust the Threshold and click on Preview. As peaks are increased by the process, iZotope has implemented a Make-Up Gain (only with negative values). Then you can choose between three Quality modes, Low, Medium or High, from faster to better results. There's nothing complex here and the results are impressive. Transients are preserved and the file is now usable. Before continuing, let's just specify that we've set all the A/B examples in order to have the same perceived level. In the previous example, the processed file should have sounded 9.6dB quieter than the unprocessed one. Another sound made of sustained chords, therefore meaning less obvious peaks, occuring outside of the attack transients. Once again, the example is a bit exaggerated: in a normal situation, the recording would have been done again. Declicker is a useful tool when it comes to clean vinyl or tapes digitizations or digital clicks sometimes occurring when there's clock or buffer issues, etc. You can choose between Automatic and Manual modes. The first mode is recommanded to process the files in one go, the latter will allow to clean step by step, when events are ignored by Automatic mode, or when clicks and pops are too closed from critical events, and when their automatic remove could result in potential loss of important musical elements. The Automatic mode has three parameters: processing Quality (High, Med or Low), Sensitivity and Maximum Click Width, in ms. You can start selecting a click in the main display, then check its length in the Values display, then adjust the Max Click Width setting and the Sensitivity. Rule#1: to achieve better results, you'd have to proceed by steps, to run several passes better than trying to remove everything at once. Rule#2: using Preview with the Output Clicks Only function allows to listen to the will-be removed events and to adjust the settings. This monitoring function is also available in the other Modules. The Manual mode offers only one setting, Interpolation Order. Declicker uses interpolated samples to remove a click. This setting selects the number of samples that surround the click used by the Module to make its calculation. We set the Automatic mode to eliminate the clicks in the beginning, that you can easily monitor with the spectrogram and the waveform display. One pass is enough, for a perfect result. A bit more complex, and always from the same tune, this quieter excerpt has a lot of clicks and pops blended with the open hihat. Fine tuning the Automatic mode allows to virtually remove everything, without any loss of musical informations. Another classic of audio restoration, Hum Removal will removed low frequency hum (usually occurring at 50 or 60Hz with their harmonics) that could be generated by various electrical gear. You have several settings: the frequency selection (50 Hz, 60 Hz or Free), the number of harmonics (1 to 8, including the base frequency), linking options to apply simultaneous settings, and independent settings of the filter slopes for odd and even harmonics. Linear phase filters (only available in Free mode), Hi- and Lo-Pass top up the whole sonic battery. Once again, the monitoring function (Output Hum Only) will allow to process accurately, avoiding to damage the original signal. The Module does exactly what it is supposed to do. And does it well. What makes it different from its competitors is its profusion of settings and its ergonomy. Here are the results on our "Lungs" intro. Aimed to be the miraculous tool in a complete restoration paraphernalia, Denoiser usually works in two steps: first it takes an "impression" of stationary, broadband noise, then it removes it by spectral subtraction. Each editor has devised its own sonic recipe (or licenced it from someone else), usually based of gates, FIR-FFT filters, wavelet thresholding, convolution, etc. iZotope has developed its own technology, and doesn't give a lot of details on it. However, it doesn't really matter, as the interface is user-friendly, and that is the main thing. The most common artifacts after denoise processing are phase issues, comb filtering effect, added noises (sounding aquatic- or pipe-esque) or modulation of the broadband noise. It's always hard to totally remove noises without slightly (or strongly) damage the signal, and you often have to reach a compromise between total cleaning and respect of the intelligibility and musicality, at last with the suites I've been using til now: Waves Restoration, Sound Soap Pro and TC Electronic Restoration. By the way, a review of the recent WaveArts Master Restoration suite is underway. The Simple mode is very... simple. A noise reduction setting (0 to 40 dB) and a Smoothing parameter, which reduces the artifacts that sometimes may occur. The Advanced mode logically offers more parameters: there's the equivalent of Smoothing (Musical Noise), but noise reduction is divided into two set of parameters (threshold and reduction), one for Tonal reduction (one or more constant frequencies), the other for the Broadband noise. Residual Whitening is the last setting, that forces the suppressed noisefloor curve to be close to whitenoise. Here is another example, a voice coming from an interview, with a lot of background noise. Last Module, Spectral Repair, which is rather unexpected, as you only find this kind of tool in gear or software aimed at the top of the market (meaning really expensive...). Based on analysis and interpolation of audio data, Spectral Repair can remove, attenuate, replace events or fill gaps in a recording with advanced resynthesis algorithms. The four modes, Attenuate, Replace, Pattern and Partials+Noise share similar settings. Num Bands, which selects the number of frequencies used for interpolation (from 8 to 4096). Before/after Weighting which reinforces audio surrounding the selection. Surrounding Region Length, which defines the length of the signal surrounding the selection which will be used for the interpolation (no indication of value, samples, ms?). Only available in Attenuate, Strength sets the attenuation ratio of the selection. Harmonics Sensitivity is exclusive to Partials+Noise and adjust the detected and linked harmonics ratio. Let's go back to our vocal file: you can hear high noises, which are the wooden balls of a necklace. Someone should have asked the interviewed woman to remove that necklace before recording... We'll try to remove as much noises as possible, which is rather difficult as the frequencies overlap. The selection shows where these sounds are located in frequency and time. It's way better, especially if you add the background music (which is often a trick to hide some irretrievable defaults). Of course, the sentence in this example is incomplete. We'll start by cleaning clicks, hum and noises. You have to notice the very good results on the piano part of the... piano. Generally, others Denoiser show their flaws and shortcomings when there's great dynamic differences, with typical comb filtering side effects. There's another solution to achieve better results on dynamic changes: cut and individually process parts of an audio file, then put them together in an audio editor. A bit risky, time consuming, but sometimes worthy of doing. Perhaps plug-in versions will be automation capable, therefore allowing to change some denoise parameters. However, there are still scratches, too long to be removed by the Declicker and on the other hand with too much harmonic content to be removed by the Denoiser, at the risk of losing lot of vital audio information. We'll do the same way as we have processed the vocal file, sometimes using different settings for left or right channel (one at a time), thanks to the activation arrows on the left. The best process has been to use Attenuate step by step, with 256 bands, Strength set to 2, Surrounding and Before... set to the lowest possible. Then we've used Replace to remedy to some disparities, with Surrounding Region Length set to a high value. As the whole process is quite long, I've cut the file to work only on a excerpt (which has needed nothing less than 46 selections and processing tasks), but you can clearly listen to the software potential and efficiency. The upper screen capture shows the file before processing, the lower the file after processing. You can see where Attenuate has been applied, but it's virtually impossible to see Replace actions. Even if one or two noises would have sounded better if I gave them more attention, I've never been able to obtain such a result with the tools I generally use (Waves, TC, Sound Soap Pro and others).